Man, do I love the incredible, edible egg?! Eggs are nutritious, delicious, and cheap to buy. They are also easy to make in a bunch of different ways. The only suggestions I have are 1) don’t go crazy and start drinking raw eggs, and 2) use mostly whites to keep the cholesterol low. If I have eggs in the fridge, I can make a meal. When I was single, I had omelets for dinner all the time because they were fast and easy to make into whatever size meal I wanted. I still make them often for myself when my husband is deployed. I’m not just cooking for me now, but I still use eggs as a main dinner ingredient often. 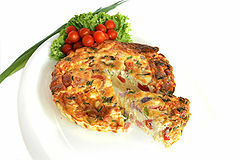 I made a frittata last night, which was amazingly easy and yummy, and my husband’s response was, “Wow! This is fancy!” He doesn’t need to know I didn’t have to slave away in the kitchen. Throw some flour on your face and milk it! In an oven safe skillet, start to cook your bacon. Cook for 5 mins over medium heat, then add in potato and onion. Cook for about 8 mins (or until potatoes start to get soft) and add arugula. You might notice that I didn’t mention oil, butter, or draining of bacon grease. The three slices of bacon should make a small enough amount of grease that 1) you shouldn’t have to drain it, and 2) you can use it instead of adding other oil/butter. In a bowl, whisk 2 whole eggs and 4 egg whites. Add cottage cheese, parmesan and agave to egg mixture. Once all arugula has wilted, turn off the burner and pour the egg mixture over the skillet ingredients. Move skillet to the oven and cook for 20 minutes, or until firm. If your dish will allow the heat, you can turn the oven to broil for the last 5 minutes to make the top toasty, but you don’t have to, and it’s not worth ruining a skillet just to make it a little prettier. Serve next to toasted english muffins or a side salad and you’ve got a nutritious, high protein, low-fat meal!